An old mortgage... I found this on eBay a few weeks ago, and picked it up for a few bucks. What caught my eye was the name “Dilatush” in it. I scanned the “cover” at right just to give a flavor for the thing. 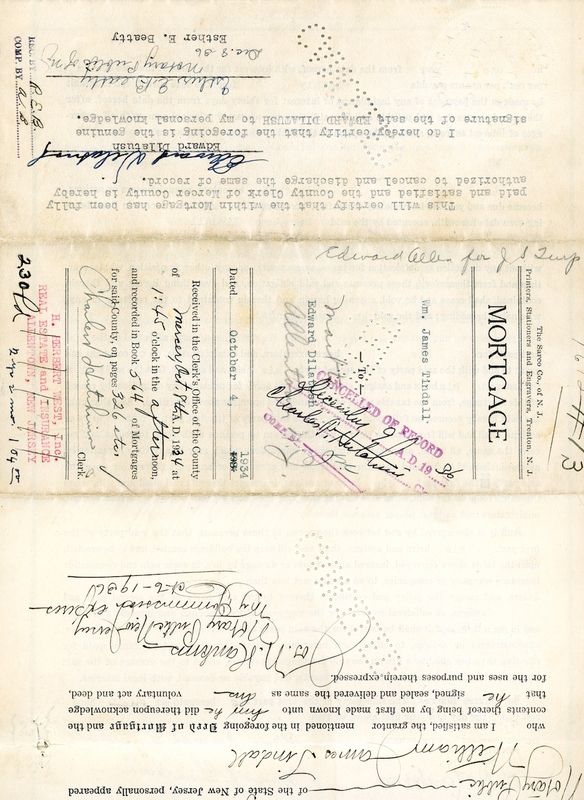 The entire mortgage is on two sheets of legal sized paper, typed on both sides. The buyer and debtor is Edward Dilatush, the older brother of my grandfather (father's side) Earle Dilatush. That makes him my great-uncle, I think. In 1934, he bought 5 acres of farm land for $1,000, put down $200 and took out a mortgage for the $800 remaining at 6% APR. He paid it all off in two years and two months. All those references to old-fashioned surveying, in a document less than 100 years old! Chains and links refer to a now-obsolete method surveyors used to measure distances. I can't imagine New Jersey still relies on stones in the middle of the street, but “monuments” demarcating surveying “sections” are still the norm, at least in the western U.S. Often these are concrete blocks, deeply sunk, with a round brass medallion sunk into the top. We have one of these on our property in Utah. The angles specified in quarters of a degree (1/1440th of a complete circle) are reflective of the limitations in precision of the surveyor's equipment of the day. More accurate equipment was available, but was so very expensive that it wasn't used for ordinary surveying. I know this property, something I didn't expect when I picked up the mortgage. It was fairly close to the farm I grew up on, along what is today called Edinburg Road. I believe it was either on or close to the property that the present-day Mercer County Technical Schools are on. When I was a child, Edward's home was on it. I don't actually remember Edward – perhaps he had already died by then – but I do remember his wife and two of their daughters. I have a memory of being at their house with those daughters, playing with their kids, and especially enjoying their backyard pond (literally – this was dug out of the dirt). This would have been sometime around 1956 or 1957. I don't remember any of my siblings there, and a little oddly I remember my dad picking me up in our family's old '48 Dodge. Normally my mom would have been doing that.